I've been hearing a lot about this Vietnamese restaurant near Banawe for months. I couldn't find the time to visit this restaurant though given that it's very far from where I live. Thankfully, after several attempts, I finally found myself around the area and decided to do a side trip to Tra Vinh. Since its opening last year, Tra Vinh has been receiving recognition from several media outlets and food apps listing it as one of the top Vietnamese restaurants in Manila. And I was so giddy when I finally had the chance to try its dishes. I got the chance to meet its owner Michael Ang who gave me a brief background of the restaurant. 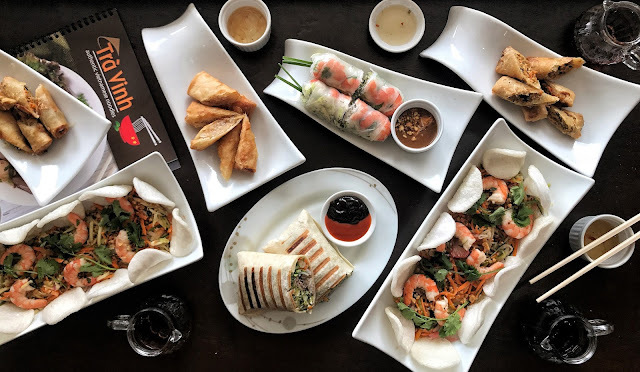 Tra Vinh is a brand that started in Australia and founded by Mr. Van Chien Ho, a native of Vietnam who specializes in Southern Vietnam cuisine. 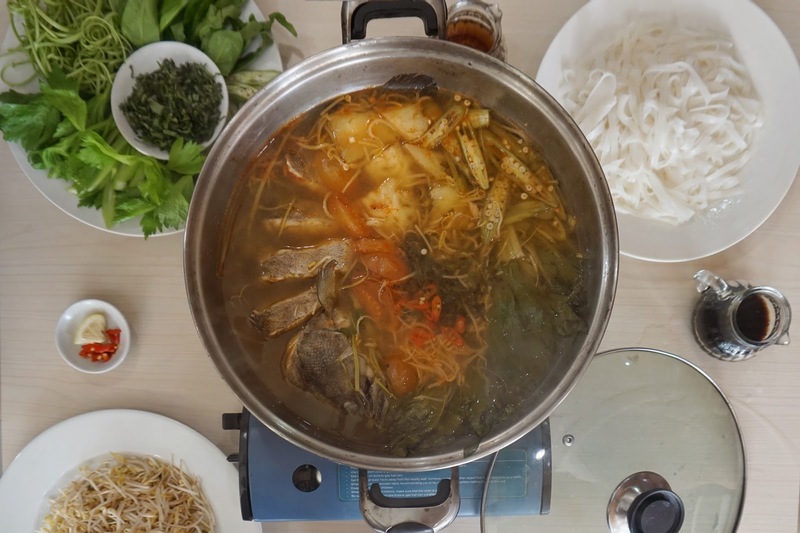 Mr. Ang also told me that the dishes I was about to taste are not the usual flavors I'm used to as the popular Vietnamese dishes here in Manila are mostly from the Northern part of Vietnam. Tra Vinh tends to be packed with its Vietnamese patrons during lunch on weekdays and more families on weekends. 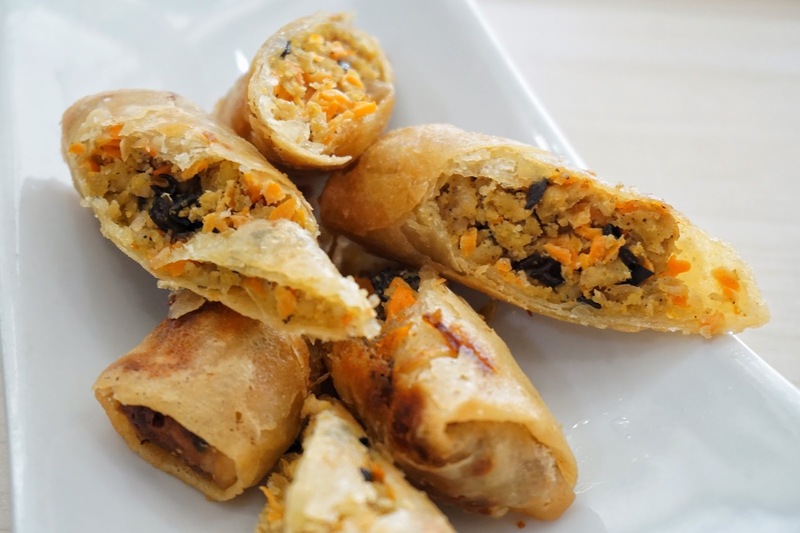 I started the meal with a some Fried Spring Rolls. 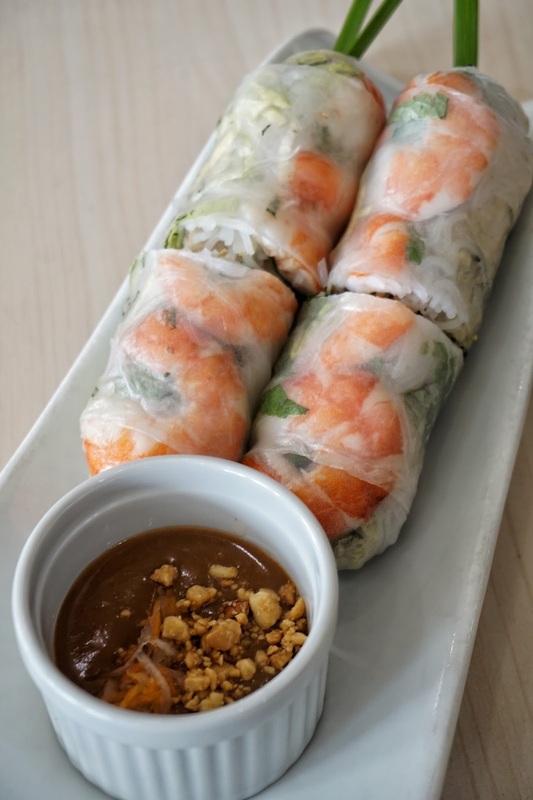 It is available in Prawn (PHP170, 3 rolls), Pork (PHP170, 4 rolls) and Vegetarian (PHP170, 4 rolls) and paired with the classic Vietnamese sauce. All were great. Fried to perfection leaving the wrapper crunchy yet the filling juicy and flavorful. It was hard to pick just one as all tasted fantastic. But if I have to choose, I'd go with prawn. I'm biased though as I love seafood. The Prawn Pomelo Salad (PHP250) and Prawn Mango Salad (PHP250) was a lovely dish to munch on in between as its refreshing light flavors cleanses the palate. I prefer the one with pomelo, but again, it is based on personal preference. But if you prefer tangier flavors, go for Prawn Mango Salad. 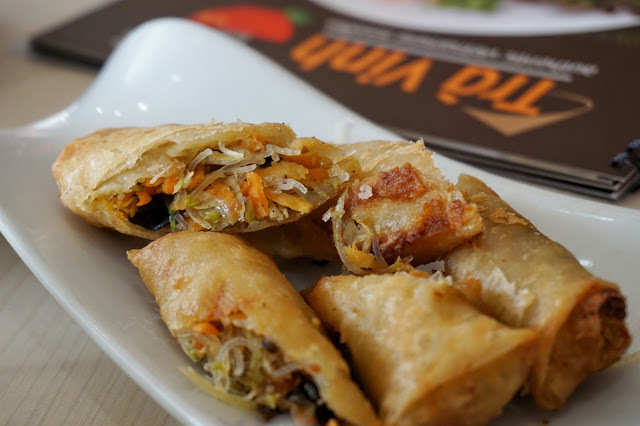 Another refreshing and healthy dish to try is Fresh Spring Rolls (PHP190, Pork and Prawn Rolls | PHP180, 2 rolls of Prawn, Pork or Vegetarian). 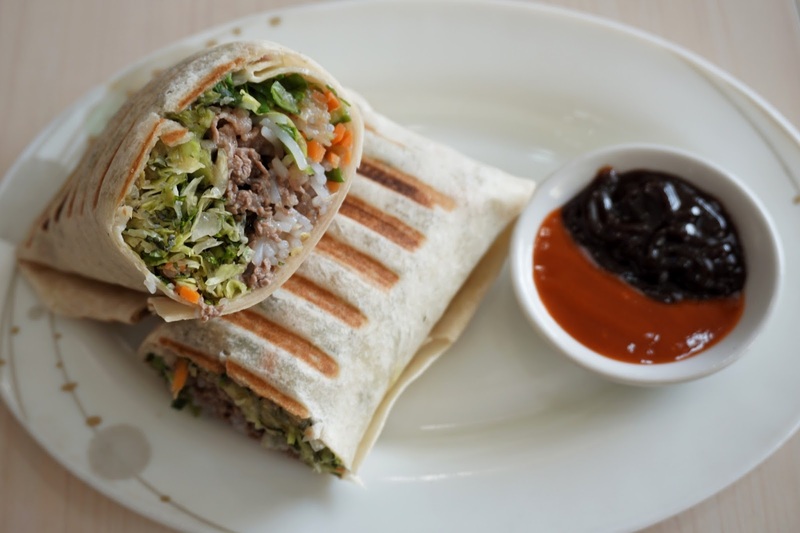 And Tra Vinh probably serves the heftiest fresh spring rolls in Manila! Stuffed with fresh veggies and prawns, I had to cut the spring rolls in half to make it bite-size. 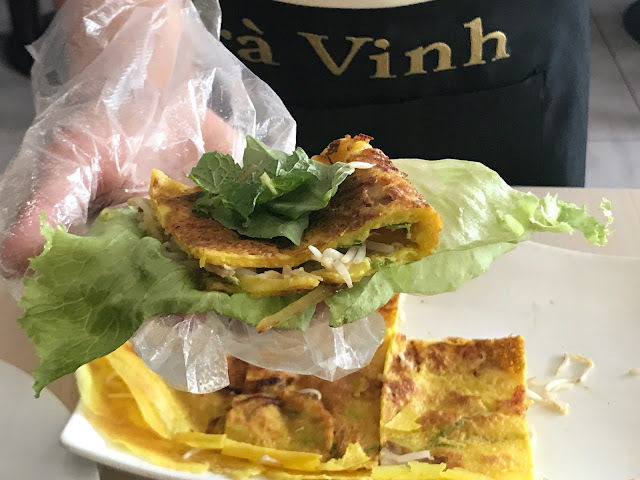 If you're visiting with a big group, I highly recommend Tra Vinh's Vietnamese Pancake (PHP290 | PHP60 for additional vegetables). 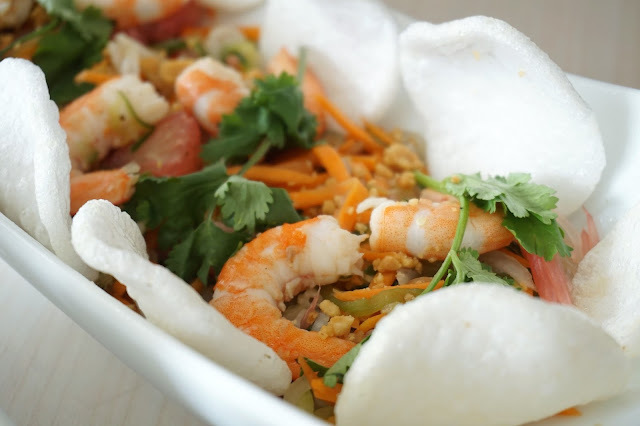 Do not be deceived by this crispy pancake made with shrimp, pork and veggies. Its serving size is huge and very filling. Best eaten with Tra Vinh's special sauce which adds depth flavor-wise, this dish would serve as an excellent starter or even a meal on its own. Request for the staff to help you wrap this delicious monster in lettuce if you do not have a lot of time to spare. The Chili Salted Squid (PHP200) was also great! 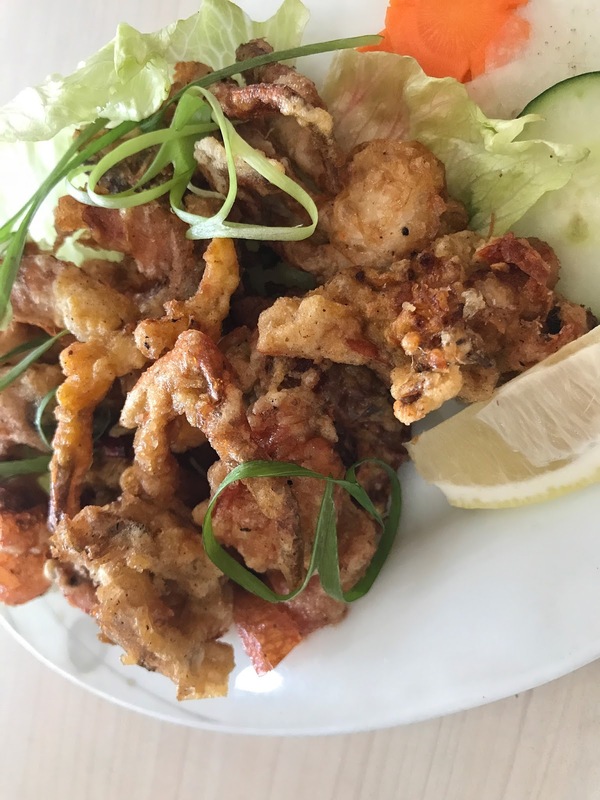 I loved the combination of the crunchy seasoned batter and the snap from the fresh squid. I would definitely get this again! 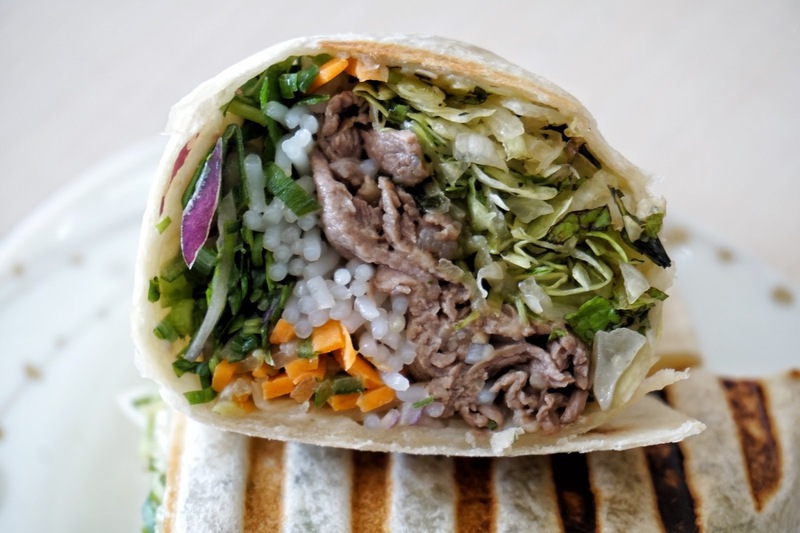 Tra Vinh's Phorrito was the innovative dish everyone went crazy in love with. 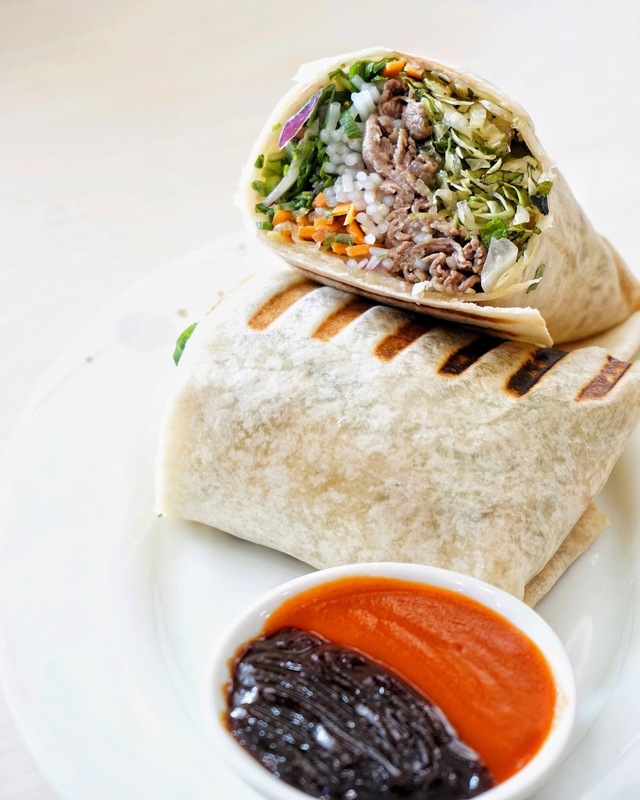 Everything we love with the classic beef pho was wrapped burrito style in a grilled wheat flour tortilla. 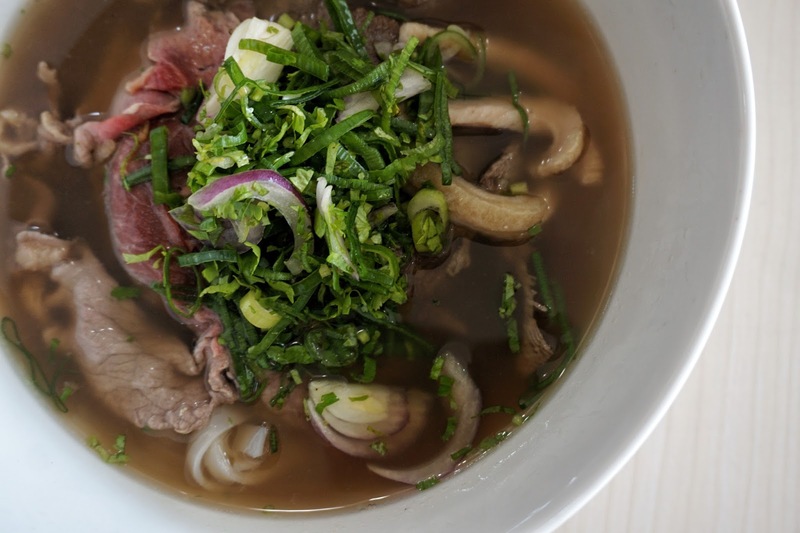 Each bite was packed with flavor and oozing with the clean and herby taste of pho. And just like Tra Vinh's other dishes, this one is great for sharing too. As I finished my portion of Phorrito and adjust my pants, I started to indulge in Tra Vinh's noodle soups. Spoiled during my visit, I got to try Pho Dac Biet or Combiantion Beef Noodles (PHP180, small | PHP230, regular | PHP299, large), Spicy Combination Noodle Soup (PHP230, regular | PHP299, large), Tra Vinh Special Noodle Soup (PHP230, regular | PHP299, large), Braised Duck Noodle Soup (PHP240), Braised Beef Noodle Soup (PHP230) and Crab & Seafood Drop Rice Noodle Soup (PHP198, small | PHP248, regular | PHP328, large). 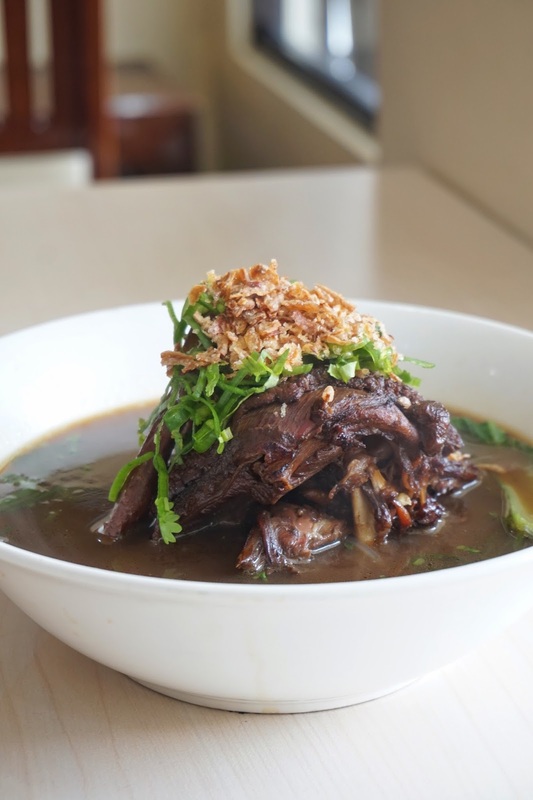 Healthy eaters would go gaga over Pho Dac Biet with its rich yet clean flavors. The taste of beef was well defined. 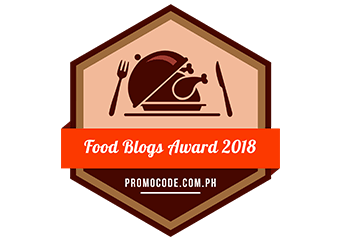 And it's impossible not to have rich flavors when there are abundant meat in the bowl--slices of beef shoulders, raw New Zealand rib eye, beef balls, and beef tripe. The broth was made extra flavorful with 16 traditional herbs. Packed with protein, this is one meal you won't feel bad finishing to the last drop. Braised Duck, prepared with traditional herbs, spices, mushroom and quarter piece of duck was packed with complex flavors. It was sweet, salty and at the same time had that nice earthy flavor from the herbs and mushroom. It was definitely not the usual pho and it took me a bit of time to get used to its rich flavor. I was a bit scared to try the Spicy Combination Noodle Soup as my tolerance for anything hot is low. 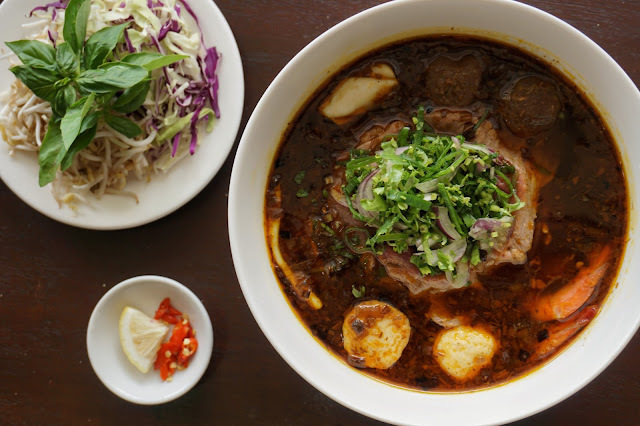 But Tra Vinh's spicy soup is the type that you simply cannot resist. 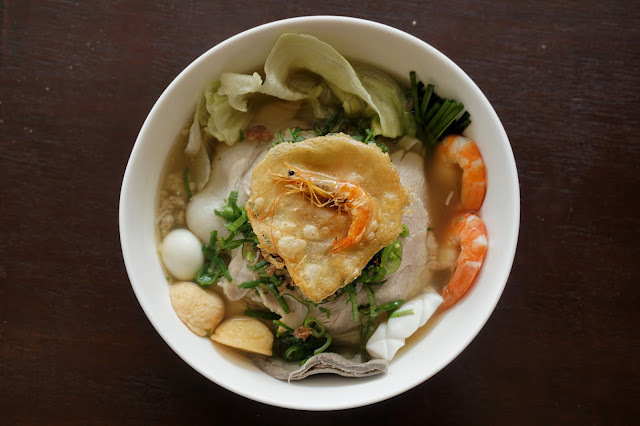 The three meat broth mixed with traditional herbs and spices, raw New Zealand rib eye, fresh prawn, squid, beef ball and fish ball gave this lovely bowl a divine blend of flavors from land and sea. 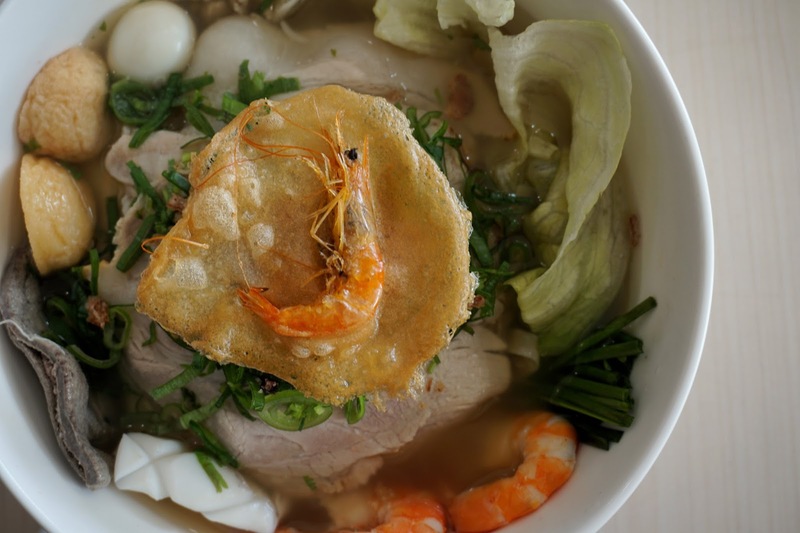 Tra Vinh Special Noodle Soup is a blend of chicken and seafood broth topped with pork loin slices, prawn, squid, fish ball, pork liver slice, quail egg and prawn cracker. It reminded me of the spicy soup but without the heat and beefy taste. It had a cleaner and lighter taste closer to the pho we are used to. 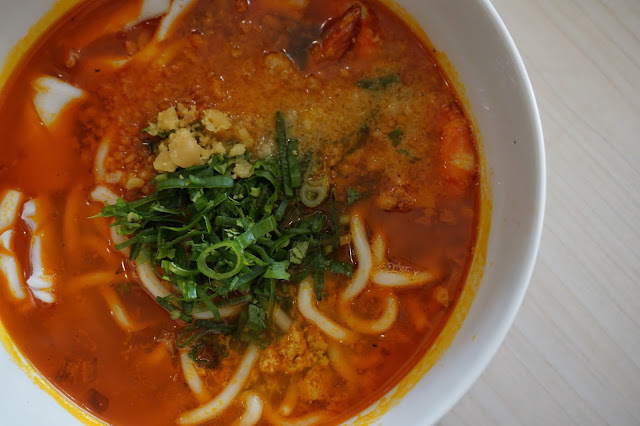 My favorite though is Crab & Seafood Drop Rice Noodle Soup. The thick soup packed with crab meat had a lovely sweet, salty and slight tangy flavor that I like. I found it very heavy though and had a hard time finishing a small bowl on my own. 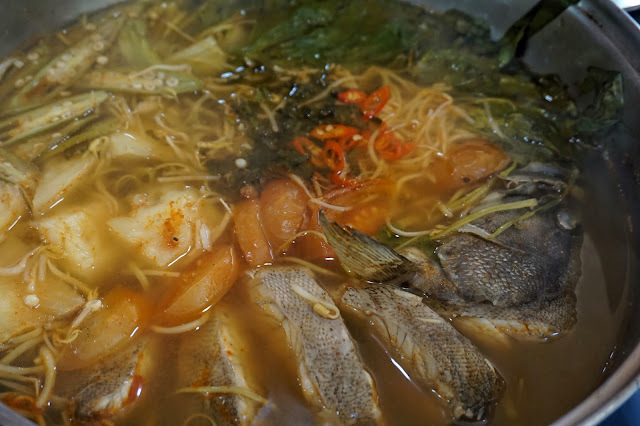 But if you're with a group and plan to order other dishes, I'd recommend Fish Soup (PHP999). This dish is served in a huge pot and comes with generous serving of leafy vegetables and bean sprouts for added crunch. Its tangy taste will definitely tickle your taste buds and make you eat more. I had to run along before they served desserts. But one of the desserts that I loved during one of my other visits was its Vietnamese Coffee Jelly Float (PHP120). 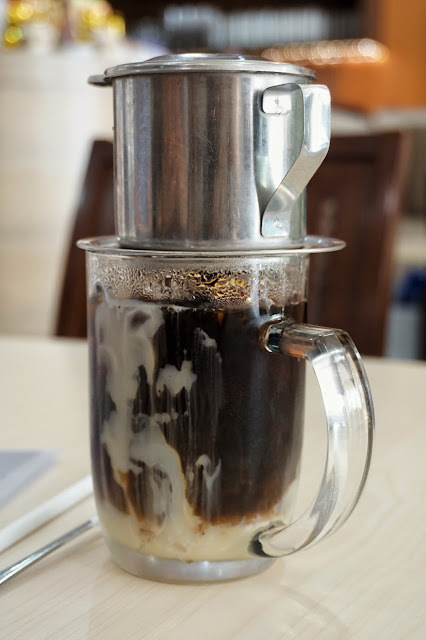 It was different from the ones I've had before as Tra Vinh uses Vietnamese coffee beans to make its homemade ice cream. I was blown away by the pronounced flavor of coffee in every mouthful. Overall, Tra Vinh is a place to visit if you're looking for a Vietnamese restaurant that offers a wide array of dishes. It is definitely a place to beat in terms of quality and quantity. 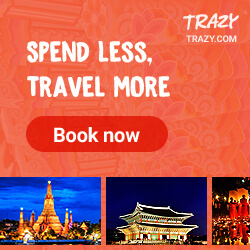 Tra Vinh is located at Unit 3, 109 NS Amoranto Corner Cordillera Street, Maharlika, Quezon City. It also recently opened a branch in Ayala Malls Cloverleaf.